The ultimate outdoor ceramic kamado cooker and smoker. Primo is proudly made in the USA and is the only oval-shaped ceramic grill, which delivers the highest cooking flexibility and efficiency of any other ceramic grill, creating two different and distinct cooking zones. Also, every Primo grill is hand-made and carefully inspected for quality before it leaves the factory, so you can feel secure about your investment. For even more confidence, Primo backs its grills with a limited lifetime warranty that is backed by a twenty year guarantee. With Primo Grills, you get the most efficient ceramic composition and largest cooking surface on the market today! Now let's take a look at some of the reason why you should choose Primo. 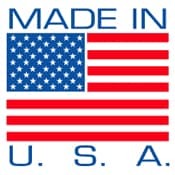 Each Primo ceramic grill is carefully manufactured in the USA. Primo starts with raw materials that are harvested in the United States to make the ceramics. The molding, drying, firing, hand assembly and packaging of Primo ceramic grills all take place at their manufacturing plant located in Tucker, Georgia. Primo is extremely proud of the American ingenuity and quality craftsmanship that they put into each of their ceramic grills. It's no wonder that 4 out of 5 Americans prefer products made in the USA. Surprisingly, most other major ceramic grill companies purchase their grills from foreign companies rather than making the grills themselves. Primo Grills are truly American as apple pie, in fact you can bake one on any of their grills. PRIMO 13" PORCELAIN PIZZA BAKING STONE FOR OVAL JR.
PRIMO CAST IRON DIVIDER FOR OVAL JR.